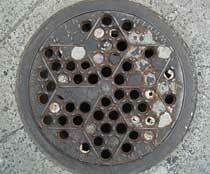 7 Worth St N. Y.
Jacob Mark (1834-1904) was born in Germany (Bavaria) March, 1834, and immigrated to the U. S. in 1850. By the time of the 1860 U. S. Census he was already a "patent light maker" - i. e., manufacturing vault lights in New York City. In 1891 Jacob Mark applied for a passport where he declared that he was born 3 March 1834 in St. Alban, Bavaria, Germany, that he emigrated from London July, 1850, and became a naturalized citizen 10 Nov. 1857. From approximately 1872 to 1882 Jacob Mark was in business with Joshua K. Ingalls as Ingalls, Mark & Co. and/or Ingalls & Mark. This is the same Joshua K. Ingalls who was in business with Lewis R. Case during the 1860s. (More on Ingalls and Case can be found on the L. R. Case vault light page.) It is Joshua Ingalls's Patent No. 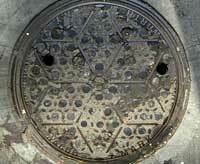 146,074 for "Illuminating Vault-Light Covers" (issued Dec. 30, 1873) whose date appears on Jacob Mark's vault lights. The 1880 U. S. Census (non-population schedules) recorded Ingall[s] & Mark, Vault Lights. They owned capital worth $7000 and raw materials valued at $8000. They employed an average of 10 workers, and paid total annual wages of $4200. A skilled worker was paid $3.00 a day, and ordinary laborers were paid $1.50. The business was in operation full time 12 months in the year, and the value of the past year's product was $25,000. Jacob Mark's business was described in the following terms in Illustrated New York; The Metropolis of To-Day (1888): "Jacob Mark, Manufacturer of Concrete Illuminating Tile, No. 7 Worth Street. - ... This business was established in 1876, by Mr. Jacob Mark ... Fifty experienced workmen are employed, and the machinery is driven by steam power. Mr. Mark manufacturers largely Patent Concrete Illuminating Tile, and all kinds of vault lights for areas, sidewalks, roofs, floors, skylights, etc. Mr. Mark is assisted in the management of the business by Mr. John W. Mark, the Superintendent." Jacob Mark's obituary in the New York Times, 17 Nov. 1904, p. 9, read, "Jacob Mark, one of the oldest manufacturers of architectural iron work in the country, died yesterday at his residence, 327 East Fifty-Fifth Street. He was seventy years old, and leaves a widow. 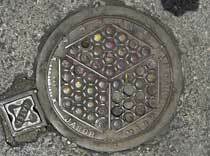 Mr. Mark was identified with the Vault Light Manufacturing Company at 7 Worth Street. He was a member of the Building Trades Club, the Mechanics and Traders' Society, the Architectural Iron Workers, and the Building Trades Employers' Association." This advertisement for Jacob Mark is taken from Trow's New York City Directory for 1892. I have not been able to locate John W. Mark's patent dated 30 Aug. 1887 (referred to in the ad), but his Patent No. 436,085 issued 9 Sep. 1890 describes an unique arrangement of lenses "to secure increased light-transmitting capacity for illuminating-tiles." Jacob Mark's sons carried on the business after his death. These were Charles W. Mark (1862-? ), John W. Mark (1856-1927), and Jacob L. Mark (ca.1871-?). They closed the business around 1910/11. This advertisement for Jacob Mark appeared in the Architectural League of New York's Catalogue of the Eleventh Annual Exhibition, 1896. John W. Mark is named as superintendent. The website glassian.org has additional information on Jacob Mark & Sons, including photos of vault lights. 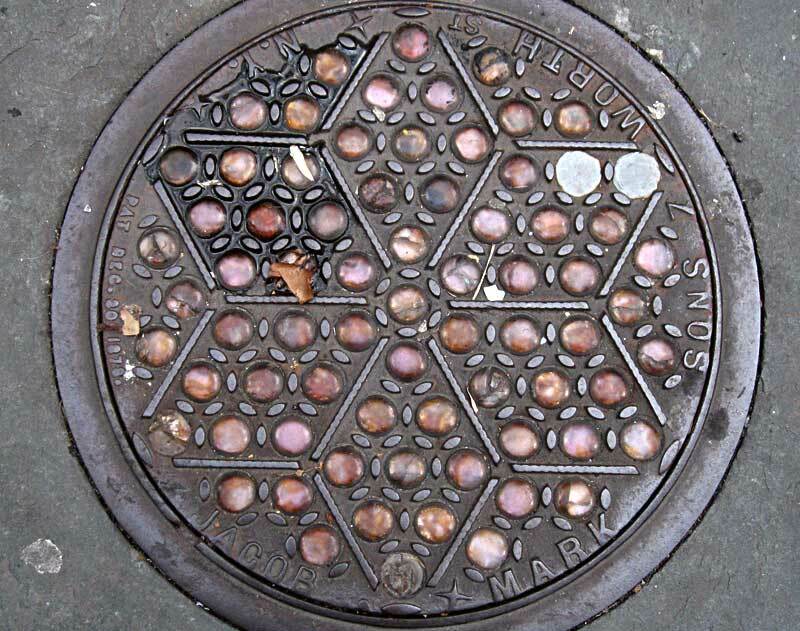 These vault lights marked Jacob Mark Sons / 7 Worth St NY are found in front of The National Bank, 147-149 N. Sycamore St. on the southeast corner of Tabb St., Petersburg, Va.
Jacob Mark Sons also manufactured coal chute covers. 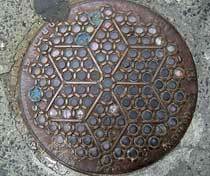 Examples are found on the Jacob Mark manholes page.